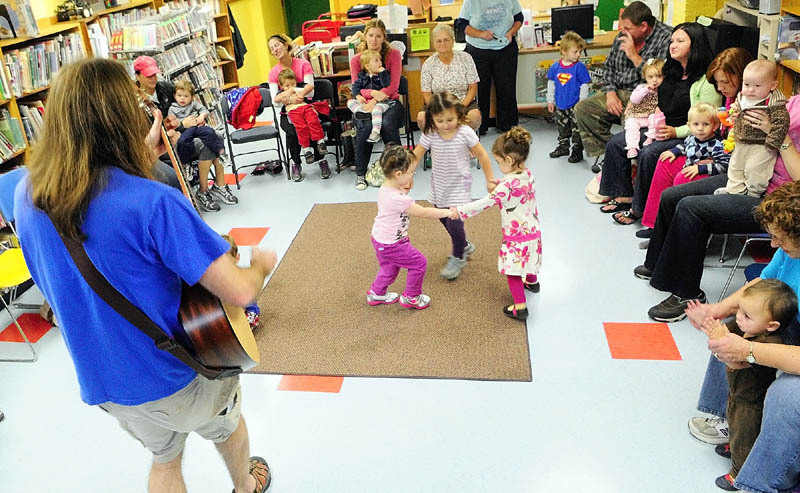 Harley Smith stood in front of a semicircle of seated adults and smiling children with an acoustic guitar and a bag of vegetable puppets by his feet at the Bailey Public Library on Wednesday . 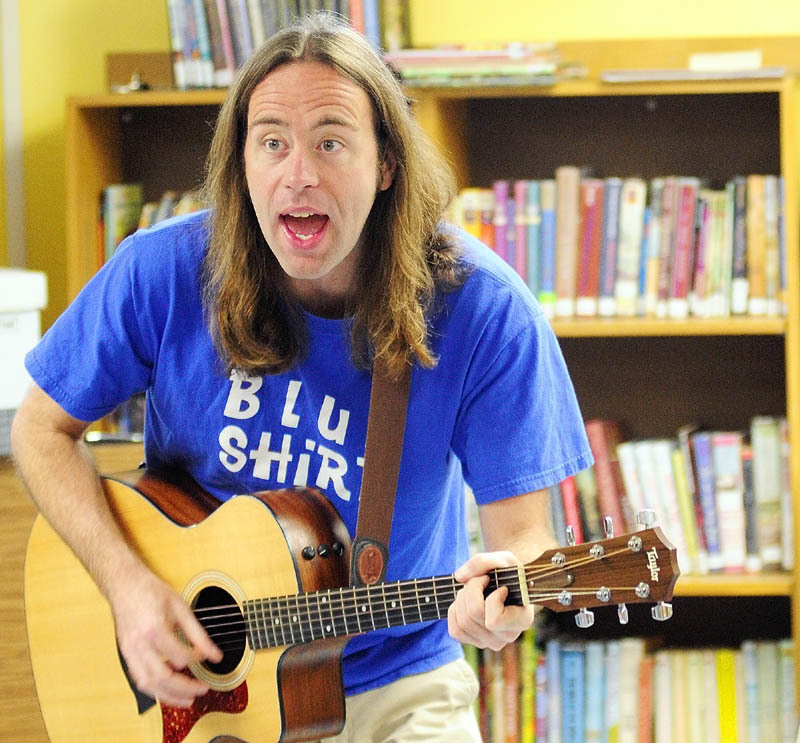 . .
WINTHROP — Harley Smith stood in front of a semicircle of seated adults and smiling children with an acoustic guitar and a bag of vegetable puppets by his feet on the children’s floor of the Bailey Public Library on Wednesday morning. “If you don’t like any of my songs, I’m going to give you a free car,” said Smith, to the delight of the kids — and a few parents. Smith — or Mr. Harley as he’s known — has been entertaining children with his music for the last 10 years throughout Maine, first getting his start by playing at Barnes & Noble and then at a preschool. Although he has played drums for rock bands with adult audiences as well, he is best known for his energetic shows for children at libraries, fairs, schools and birthday parties. Smith said he tries avoid performing on stages because they create a barrier between him and the kids. “The only difference between a child and myself, in my mind, is my size,” he said. Carrie Arsenault, executive director of the Children’s Discovery Museum in Augusta, where Mr. Harley has a show tonight, said Smith knows how to connect with children. “He just gets right down on the kids’ level. He talks their language and knows how to speak to them,” she said. Tonight’s show at the museum is one of Smith’s last shows in Maine for the foreseeable future and will serve as a “goodbye party” for the performer, who will be moving to the Orlando, Fla. area on Oct. 1. Smith, who lives in Belgrade, is following his wife who moved to Florida two months ago with their two sons, ages 6 and 10. He said his wife wants to pursue her dream of working with dolphins. Smith has his sights set on another world — Walt Disney World Resort. He said the ultimate job would be playing music for children there. “I want to do this for the rest of my life if I can,” Smith said. Smith said he only started drawing larger crowds in the last few years, an increase in popularity he partly attributes to his presence on social media. The ages of Smith’s fans usually range from newborns to about 10 years old, although he said some kids in the nine-to-10-year-old range lose interest by then. Many of his songs call for audience participation, asking the kids to dance certain jigs or repeat lines. Smith’s songs also tend to be educational. Smith said parents have told him that their kids brush their teeth because a Mr. Harley song is part of their nightly routine. He also has a song from the perspective of vegetables, encouraging kids to eat them. “We’ll make you healthy, we’ll make you strong, ’cause that’s what veggies do,” sang Smith on Wednesday, as children holding Lee the broccoli, Tom the tomato, Gus the asparagus and Art the artichoke puppets danced in circles in front of Smith. Smith said on top of being able to positively influence children’s lives, he enjoys playing for kids because they tend to be more appreciative than adults at performances. “The honest, genuine happiness the children show is one of the reasons … It makes me feel what I’m doing is worthwhile, playing for kids,” he said. Maggie Freemon, a 21-year-old Randolph woman who is a nanny for two local girls, said she and the girls are frequent visitors of the museum and enjoy Smith’s shows. Arsenault said the museum has hosted Mr. Harley shows once a month over the summer and that Smith has been the most consistent performer for them. After Smith’s Wednesday show in Winthrop, many parents and kids approached him, thanking him for his shows over the years. And luckily — for Smith’s sake — no one could take him up on his free car offer.